Over seven thousand LED lights are installed on every window of the Washington Street façade of the GoggleWorks Center for the Arts. This exciting, programmable light sculpture, entitled Thought Process, uses LEDs as an artistic medium to reflect the creativity that goes on inside the building. 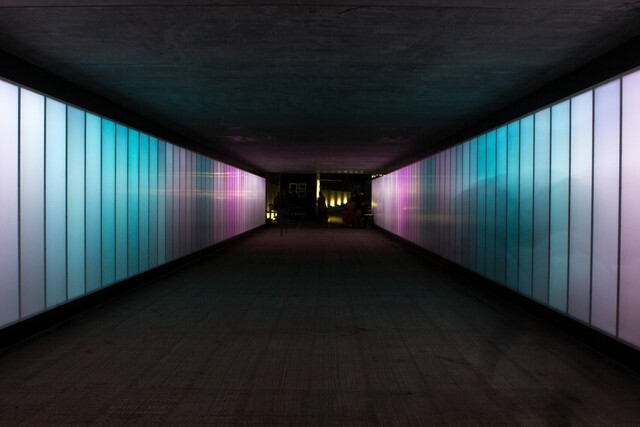 Thought Process was designed, created and installed by Lyn Godley, a product designer and lighting artist. 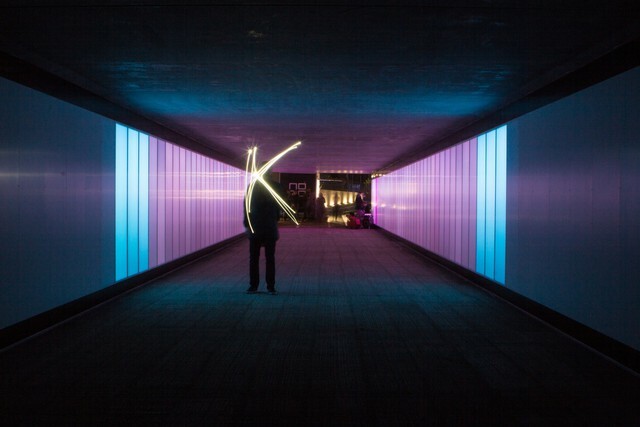 The installation uses iColor Flex SL from Philips Color Kinetics to literally “draw” light across the building. From dusk until 11 pm, seven innovative light sequences use over 7,000 RGB LED nodes to create various patterns. A new light sculpture, Thought Process, wraps light across the façade of the five story GoggleWorks Center for the Arts in Reading, Pennsylvania, USA. Unveiled to celebrate the Center’s third anniversary, the installation uses iColor Flex SL to “draw” flight across the building. The original design has three lines sweeping across the building: a blue line draws in a circular motion, a red line sketches a vertical zigzag pattern, and a green line traces a vertical heartbeat sequence. Built in 1871, the building which now houses the GoggleWorks Center for the Arts is listed on the registry of historical landmark buildings so nothing could be altered on the exterior of the building's façade. Godley used the 85 windows to create a canvas of animated light to reflect the creativity taking place inside the walls of the Art Center. However, this is only the beginning of the designs that can be created on this very unique canvas. "I envisioned using the façade as a canvas with animated lines of color drawing themselves across the façade in a number of curly, zigzag and wiggly lines—as though the sketching taking place inside the building was visible on the outside," Godley says. "The idea was that eventually the façade would also become a canvas to teach students to design upon, thus continuing to change the imagery while using light as a medium for art students to explore." Kind of light creation : 7100 LED lights are installed on every window of the façade of the GoggleWorks Center for the Arts. The installation uses iColor Flex SL from Philips Color Kinetics to literally “draw” light across the building. From dusk until 11 pm, seven innovative light sequences use over 7,000 RGB LED nodes to create various patterns. Resolution and transmitting behaviour : 7100 LED light modules (Philips Color Kinetics iColor Flex SL) programmed in seven animated sequences. Luminace : The lights are used from dusk until 11:00pm every night. Urban situation : The building can be seen from different angles and from various taller buildings in a dense urban environment. 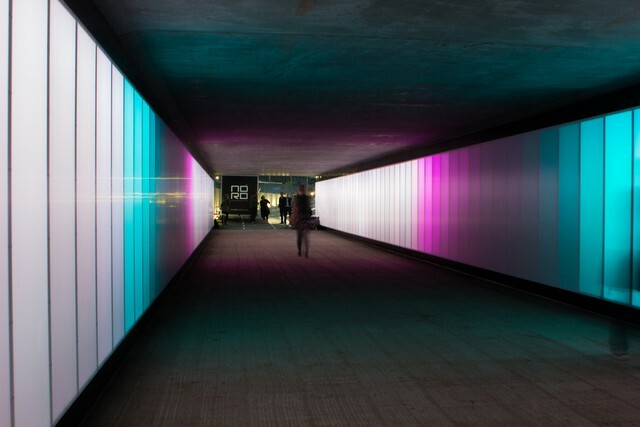 Description of showreel : The sequences display the illusion of colored light drawing across the façade.